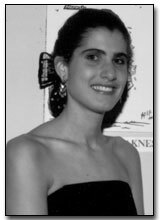 An All-American swimmer at UC Berkeley, Cheryl Kriegsman won five gold medals at the 1985 World Maccabiah Games, dominating the women's freestyle and relay swimming events. That year, she also won a silver medal in the 100-meter backstroke. At the 1987 World University Games, as a member of the United States National Swim Team, Cheryl cap-tured a record-setting gold medal in the 4x200-meter freestyle relay and a silver in the 800-meter freestyle event. Between 1986 and 1989, Cheryl was named All-America twelve times. In 1989, as Cal-Berkeley swim team captain, she was named to the College Swim Coaches' Association and Pac-10 Conference Academic All-America teams.